Garvey is not interested in sports at all. He is interested in reading, science, and jokes, which his father does not value. His dad keeps trying to pique his interest in becoming an athlete and is not able to drop the topic. Garvey knows he is not an athlete but is not certain who he is. He faces bullies at school due to his weight and awkwardness. Finally Garvey’s best and only friend since first grade guides him to Chorus at school, where he finds his place and a second friend. His wonderful voice is valued and his confidence grows. Now his dad has something in common with him at long last, since many years ago he sang in a band. This short, small book offers a heartfelt story about finding one’s place and uses a poetry form that may be new to many. It is told in tanka poetry which involves five lines with a particular number of syllables for each, and is explained at the back of the book. Spend a little time with Garvey and friends Joe and Manny to relive what it is like to be an adolescent again. You will leave content. Grimes, Nikki (2016). 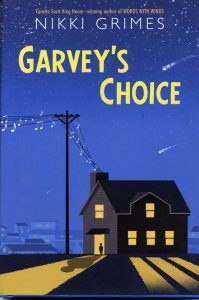 Garvey’s Choice. Honesdale, PA: Wordsong.